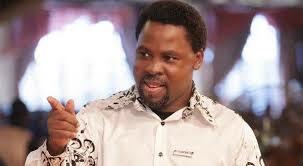 Following backlash over the failure of his prophecy on the U.S. election, Prophet Temitope Joshua, the Head of the Synagogue Church of All Nations, says he did not miss the mark but Lack of spiritual understanding made people misinterpret his prophecies. Joshua had few days before the election predicted that a woman would emerge victorious. However, he was proven otherwise when Donald Trump beat Hillary Clinton at the polls. “We have seen the outcome of the election in America. Having read, you will notice that it is all about the popular vote, the vote of the majority of Americans. “In this case, we need the Spirit of a Prophet to recognize or to know a Prophet. Our levels are different. We are not on the same level”, an explanation to which he received applause from the congregation. “We might have great cathedrals, huge bells, and all kinds of activities that are good by human standards but human point of view is limited”, he posted on his Facebook timeline. While quoting 1 Corinthians 1:25, the Prophet said: “The foolishness of God is wiser than that of men and the weakness of God is stronger than that of men. There is no shortcut to spiritual maturity unless earthly understanding gives way to spiritual enlightenment. “I see many people trying to interpret prophets on the basis of their own minds and ideas. The prophecy seems to cause uproar, to many who gave it different meaning and interpretation. “Finally, campaigns and elections in any democratic country in the world are never about one person, it is about the country we care and love. Whichever way it happens, we must accept the outcome and then look to the future (God), the Author and Finisher. Democracy is all about accommodation. All democrats must value the process of democracy more than the product. God bless the United States of America”, he said.